Highly spirited kung fu romp with the stars of The Secret Rivals which delivers practically non-stop chopsocky action based around a broiling historical premise. Don Wong and John Liu play plucky patriots masterminding the downfall of a Manchu warlord (Han Ying) whose army is planning to cross the Formosa Strait and surround the remaining Ming dynasty forces stationed in Taiwan. With a majestic score lifted (probably illegally) from Hang ‘em High – and with a brilliant two-on-one finale featuring ‘Northern Leg’ Liu and ‘Southern Fist’ Wong doubling up on ‘Shallow Head’ Han Ying – this relentless film makes for fun, head-kicking entertainment. Best viewed with whistles and a fog horn. 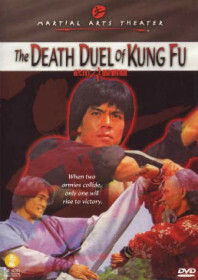 AKA: Showdown of the Master Warriors. Studio: KW HK Film Co.